Hi all. Vicki here with this week's colors. First though, I need to announce the Favorite from last week. Mary said"Love the beautiful spray of flirty flamingo flowers and the mint macaroon color wash on this beautiful card." Please keep in mind, too, that while we list SU colors for the challenges, these are just color reference points. Use the closest colors you have. We want everyone to be able to play!!! Please put CC592 in your keywords section (and if you have more than one challenge, use a comma to separate them) so we can find your card! Last edited by MaryR917; 07-24-2016 at 07:45 PM..
Great color combination, Vicki!! Here is my card for the challenge! Thanks for the beautiful colors!! Thanks for these great colorsn here's mine, was difficult to stitch because it's very hot!! Here's my card using these lovely colors. Fun colors! Thanks, Vicki! Here's my Sparkle. Thanks so much for looking. Pretty color combo! Thank you Vicki. The colors and the dessert were just what I needed to proceed forward on a card design I wanted to try. Thunderstorm moving in. Have to get off computer. Will comment tomorrow. Here's my card with a dimensional shell for dessert. I cut the shell twice - Cut one of them in half along the white area of the shell. I glued the small half directly to the other shell and put the other half on dimensionals. here is my 3 remarkable flowers card. thanks for looking. A bit later than usual! Vicki, I am so sorry I misspelled your name above, I have corrected it here! 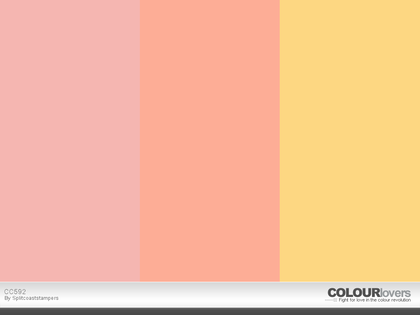 Vicki: When I look at your colors in original email, the first one looks more like Blushing Bride than Calypso Coral. I guess we should refer to the names of the colors and not the what we see in the paint chip. Correct? Her is my card for the ,CC592, challenge. Thanks for the fun challenge, and thanks for looking. I use die cuts all the time for my cards, so wanted to step it up a notch and use the paper piecing technique. This week's colors were perfect for what I had in mind. Hope you enjoy! I created this card for the Sketch Challenge using the colors for the Color Challenge because I love Vicki's selection of colors. Therefore, I'm submitting my card for the Color Challenge as well. Julie Gearinger likes this post. This is such a fresh combination!